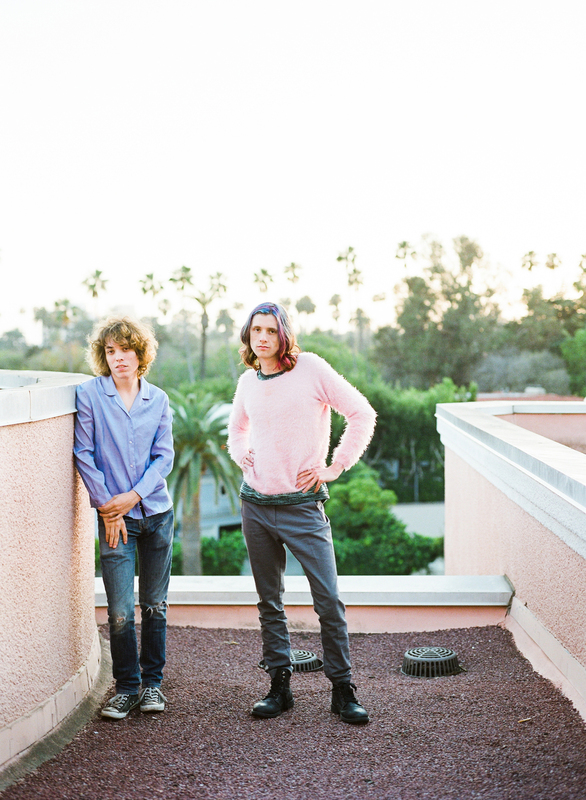 Jonathan Rado (left) and Sam France of Foxygen. Photo: Cara Robbins. “It’s easy to talk about an artist in terms of who they sound like,” says Jonathan Rado on the phone from North Los Angeles. It’s a tendency his band, Foxygen, is familiar with. Foxygen has amassed heaps of comparisons to flattering sixties icons (dimpled sock-hop soundtrackers to acid swirled festival rockers and grease-haired, hiccuppy crooners) as glittering and irrelevant as treasures in a cave. “We” is Rado and bandmate Sam France, and their thing began in 2005 when the then fifteen-year-olds obsessed over “electro hip-hop white people music” (Beck, The Flaming Lips) and concocted chord progressions in their childhood bedrooms. A stint at different colleges found them messaging Funkadelic tracks to each other’s dorms. By 2012, they’d dropped out and dropped Take The Kids off Broadway, then almost immediately the jubilantly titled We Are The 21st Century Ambassadors of Peace & Magic, both albums deeply felt and received with warmth and curiosity alike. Foxygen was an instant enigma, flickering from grinning kid-brother sincerity to grand performativity, depending on how you tilted your head. “We’ve always sort of adopted characters,” says Rado, “we met in theatre in high school and started this dysfunctional joke band called Coronel Bedlam and the Salty Biscuits, and made a little film where Sam was an eccentric front man and I was like a silent, savant drummer.” Foxygen’s new album, …And Star Power, riffs off the idea of meta-musical takeover; a four-part, odd-concept double album over the course of which Star Power, a fictional projection of the wilder, punker side of Foxygen’s persona, gradually seizes control. Rado trails off hesitantly for a moment, as if it might not be okay to publicly admit that he loves his rock star life but needs to get back to his quiet neighborhood where nobody knows him and he can hang out with his dog, (Tom) Petty. Then he laughs and alights on the paradox of his introversion vs. his deep anxiety about losing a finger (“in a freak accident or something, even though I’m pretty careful”) thereby truncating his stage career. But it’s just that endearing human cohesion of goofiness and sincerity, shyness and swagger, being your true self and also putting something on that makes you feel even more real, that makes Foxygen so fascinating to follow. The album itself is its own kind of dream. Not only did it allow for the life-goal realization of recording at Rado’s house with guest drummer Steven Drozd of The Flaming Lips, but the double-album format is one Rado has long held in esteem. For Foxygen, that distinction is of little consequence. The theatrics and the truth are equally sincere.